Avril Lavigne and Chad Kroeger’s Marriage Trouble – Split and Divorce the Next Step? Avril Lavigne has been married to Nickelback frontman Chad Kroeger for less than a year, but apparently, that’s all it takes for the fighting to begin. Sources close to the couple claim that Avril and Chad have been fighting more than ever, and that if they continue down this path, a divorce is a probable scenario. Before going into details, I want to remind everyone that Avril and Chad are the same couple that came up with those strict marriage rules such as no clubbing or drinking when they’re apart. Is it possible that these same rules became too constricting for Chad, who loves partying and drinking? 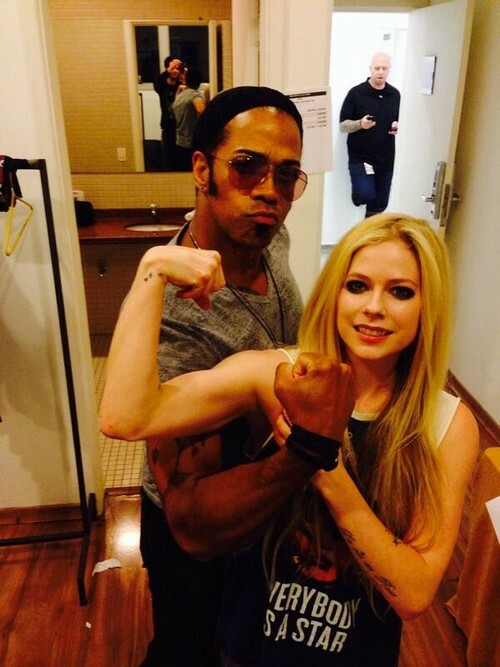 And what about Avril? Have you seen her Twitter account recently – she is sure posting pics with lots of men who are not Chad! Sources tell Star Magazine, “When they first got together, Avril wore the pants. But Chad has reverted back to his old ways and doesn’t check in with her like he used to.” Hmm, so he had marriage goggles on for the first few months, did he? It’s a common phenomenon, especially with celebrity marriages. One half of the couple tries their best to impress the other half, but eventually, they just stop trying so hard. It’s a natural progression of a relationship, but if Avril didn’t realize that marriage wouldn’t always be sunshine and roses, then she should’t have gotten married in the first place. Avril was also photographed without her wedding ring in April while out and about in Malibu, so she’s obviously sending Chad a signal. She probably thought that once they got married she would curb Chad’s sketchier impulses for good, but she’s clearly frustrated since that didn’t happen. I wouldn’t count on a divorce just yet, and knowing Avril, she’ll do everything in her power to make this marriage work. However, I also wouldn’t be surprised if they did end up getting divorced sooner rather than later. What do you guys think? Do you see Avril and Chad lasting in the long run? Let us know your thoughts in the comments below. Avril Lavigne and Chad Kroeger Break-Up and Divorce Loom Over Cheating Allegations – Wedding Ring Off? Avril Lavigne Pregnant By Chad Kroeger? Avril Lavigne and Chad Kroeger Married! Avril Lavigne And Brody Jenner Did NOT Breakup – And They Took To Twitter To Prove It!